How do you convince people from public or private organisations to join the valorisation panel of your NWO-MVI project, and how do you keep them engaged? Op woensdag 18 april 2018 vond de Innovative Medical Devices Initiative (IMDI) 2.0 kick-off plaats in Utrecht. Tijdens deze middag presenteerde Hans Rietman, voorzitter van de stuurgroep IMDI 2.0, het vervolg van het IMDI subsidieprogramma. In de 2.0 versie van het IMDI zal de benadering van het NWO-programma Maatschappelijk verantwoord innoveren (MVI) een belangrijk onderdeel zijn. NWO published a call for the development of consortia with which living labs in logistics can be started. The aim of this call is to stimulate the formation of viable consortia that will test and implement new solutions in a controlled real-life environment. The responsible innovation approach forms an integral part of the research into the Living Labs in this call. On the afternoon of Tuesday 6 March 2018, a matchmaking event will be held in Utrecht. The role of gas in a sustainable energy transition is controversial. MVI researcher Goda Perlaviciute explains how she works together with private partners on controversial topics like these, and maintains an objective position as a researcher. Extraction of natural gas in the Netherlands and the earthquakes it induces in Groningen, risks and benefits of shale gas, advantages and disadvantages of biogas: gas is under constant public debate. ‘Gas is often presented as a relatively clean or green energy source, for example by the gas industry. Yet, some see this representation as misleading or even untruthful. Clearly, perceptions of gas are diverse and sometimes even conflicting’, says environmental psychologist Goda Perlaviciute from the University of Groningen. Where do you start when you want to explore possible ethical and societal issues arising from your innovation? During a workshop organised by TKI HTSM and NWO-MVI on 30 November 2017, Peter-Paul Verbeek and Nico Nijenhuis presented the toolkit they developed to tackle this problem. The philosophy of technology ... please don't be put off by the word. Professor and researcher at the University of Twente, Peter-Paul Verbeek (45), examines how technology affects our lives and how we should deal with all the new developments that define our time, such as the fist ax and the team that have done in the past. Of we dat nu wenselijk vinden of niet, drones zijn er nu eenmaal. Peter-Paul Verbeek onderzoekt – in samenwerking met de bedrijven UAV international en Clear Flight Solutions - in zijn project hoe we er verantwoord mee kunnen omgaan. Responsible innovation is increasingly being integrated in new initiatives and programs. For example, the RIVM has developed the concept Safe-by-Design in the context of the NanoNextNL consortium and its Risk Analysis and Technolpogy Assessment (RATA) theme. Nanotechnology offers possibilities to increase the quality of life. At the same time the past has shown us that ‘unknowns’ about potential human, environmental and societal risks are raised. Attempts to address these ‘unknowns’ are generally carried out in the privacy of discussions about risks. However, proceeding in this way will lead to questions being raised about safety issues that come along with innovations at too late a stage of innovation, and hinder the full exploitation of potential benefits. Authorities and industry want to know which information is pivotal to assess whether a nanomaterial or nanotech application is safe. In December 2016 MUSTS researchers organised a workshop with farmers, activists and policy makers on the issue of rice-straw burning in Punjab, India. This burning of rice straw does not only cause enormous air pollution and damage to farmers’ health, but also depletes the soil from nutrients and wastes valuable biomass. We share a lot of personal information through digital channels, ranging from automatic bank transactions to search engines. However, the collection, storage, analysis and use of large amounts of personal data raise acute ethical and societal questions. In the section 'Uitgesproken', from the NWO magazine Hypothesis, experts respond to a new development of NWO. In November 2016, Paulien Herder (Professor of Engineering Systems Design in Energy & Industry at Delft University of Technology) responded to the announcement of a new knowledge platform on socially responsible innovation (the NWO-MVI Platform) - intended for science, business and social organisations. Video introduction by Johanna Höffken to the Dutch Government NWO-MVI funded 'Developing & Implementing Smart Grids in India' project based at Eindhoven University of Technology (TU/e). Experience MVI with this introductory animation! The animation can be viewed with VR-glasses, but also on a computer (with your mouse it's possible to adjust the viewpoint) or on your cellphone (by moving your phone, the viewpoint changes). Van maandag 24 tot en met vrijdag 29 april nam NWO deel aan de grootste technologiebeurs ter wereld, de Hannover Messe. Het centrale thema van 2017 was Integrated Industry – Creating Value. In this responsible innovation project, researchers identified the expected social barriers to the transition towards a bio-based economy and how these can be overcome. Emotions play an important role in the debate on innovations such as wind parks, robot carers and genetically-modified food. A team of MVI researchers is investigating the role of these emotions in the design of socially-responsible innovations. 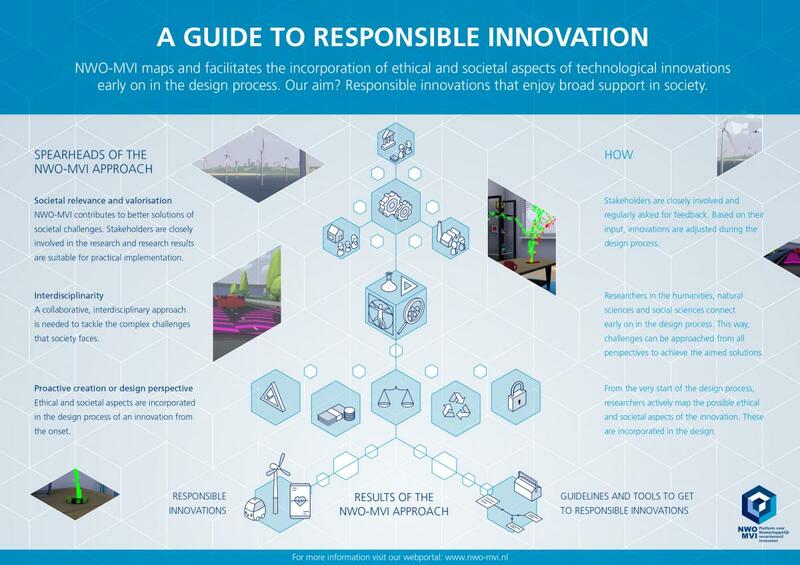 Responsible innovation (MVI, from the Dutch Maatschappelijk verantwoord innoveren) means taking ethical and societal aspects into account as early as the design phase of a new technology. Paulien Herder, professor at Delft University of Technology, explains what the NWO-MVI approach means in practise. If the transition to a sustainable energy supply is to succeed, an integrated approach that includes research into ethical and societal aspects is required. Several projects are being carried out in the NWO-MVI research programme in this field, and project leaders Rolf Künneke and Machiel Mulder tell us about their research. In de rubriek Uitgesproken, van het NWO-magazine Hypothese, reageren experts op nieuw beleid van NWO. In de uitgave van november 2016 Gert-Jan Gruter (chief technology officer bij chemisch technologiebedrijf Avantium) over circulariteit. In December 2016, the prestigious World Technology Award was awarded to Peter-Paul Verbeek, professor in philosophy of technology at the University of Twente. On 10 June 2016, the NWO-MVI research programme organised a special EU presidency 2016 edition of its annual conference at the Amsterdam Science Park Congress Centre. The conference focused on concrete tools for applying responsible innovation and was aimed at researchers, entrepreneurs, policy makers and representatives from NGOs. Participants shared experiences and best practices. 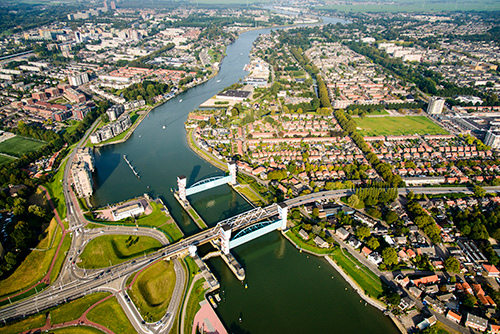 Researchers highlighted examples of current research projects within the NWO-MVI programme, which is aligned to all top sectors and the Dutch National Research Agenda. Big data: threat or public good? ICT is being used to facilitate urbanisation and enhance urban life. The City of Amsterdam is one of the Dutch cities experimenting with 'smart' streetlamps: these will have cameras, microphones, and sensors that can 'follow' citizens in the street and also perform a range of measurements (air quality, traffic congestion). Cities can also develop other ways to collect data from the behaviour of citizens. A city 'on remote control'? Should patients with no further treatment options be given access to unregistered drugs through a commercial company? And if so, under what conditions? Researchers in the NWO MVI Responsible Innovation programme are examining this question. The Responsible Innovation programme is now entering its sixth year. In January a fourth round of research projects will start. Jeroen van den Hoven, professor of ethics and technology at Delft University and chair of the programme committee, reflects on the past five years and takes a look forwards. Kees Linse, a member of the programme committee and board member of Technology Foundation STW, adds his comments. Linse speaks from the perspective of his extensive international experience in industry. Het projectteam van het NWO-MVI project ‘Maatschappelijk Verantwoord Innoveren in de voedingsindustrie’ organiseerde op 26 januari 2017 een multidisciplinair symposium over gezondheidskeurmerken, getiteld ‘Small labels, big challenges’. Tijdens het symposium werden de wetenschappelijke uitdagingen achter een gezondheidskeuzemerk vanuit verschillende wetenschappelijke disciplines belicht. Het doel van het symposium was om uitwisseling en samenwerking binnen de Wageningen Universiteit te stimuleren. David Molenaar, country division head Wind Power at Siemens Nederland, is involved in a Responsible Innovation study on wind power.